The fastest way to sell your home. Guaranteed. Are you worried that your home will end up sitting on the market for months, eating up your hard earned money? Exhausted by the thought of keeping your home “show worthy” day after day for months at a time? Do you wonder why you have to shell out 5-7% of the selling price of your home to a real estate agent just for being the “middle man” between you and your buyer? Have you heard of investors and homeowners who have saved thousands of dollars in commissions and upkeep expenses, and wish you knew how to do the same? "Oh the satisfaction I felt when I held that deposit check in my hand." I read the 5 Day Sale book cover to cover, twice, and then re-read it as I followed the steps. Over 100 people showed up at my house in one weekend and I sold it for $230,000 and closed in just 23 days. Some realtors showed up and said things like "you'll never sell it this way." Oh the satisfaction I felt when I held that deposit check in my hand. You owe it to your self to try the five day sale method - it worked for me! A little over ten years ago, I was a real estate agent struggling with a property in a rural area that just wouldn’t sell. I had been an agent for nearly a decade before that, but my experience didn’t make it easier to sell a house fast. Open house after open house came and went and STILL no offers. I could see the seller growing more and more impatient and desperate. There was nothing I could do, except suggest he drop the price to sell the house fast. He was a victim of the market, of his home’s location, of the price he wanted, and of the traditional way homes are sold across the U.S.
A little ego battered, I began searching for other methods I could use to sell this house fast. That’s when I found the book “How to Sell Your Home in 5 Days” it was a highly respected guide that was circulating among homeowners and professional investors, as their secret weapon on how to sell your home fast. You can now order the book risk-free. After reading the book, I was able to start an incredibly simple marketing campaign that advertised the property. The ad campaign drew around 50 families to this hidden, rural home. Five days after we started the marketing campaign, we had a fair market value offer—more money than I even originally thought we would get for the property. It was a sight to behold! "The best part is I have a wonderful safety net — a 'backup' buyer willing to pay only $500 less than our highest offer." What an exhilarating experience! My husband and I had our house on the market for 6 months with a broker, but had 2 offers fall through. After an emotional roller coaster ride and feeling like I was at the mercy of my broker and potential buyers, I decided to take matters into my own hands. That's when I decided I was selling our house using the 5 Day method. 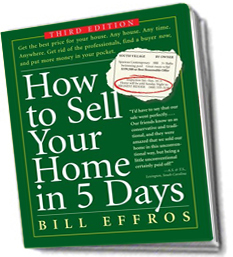 I read Bill Effros' book "How to Sell Your Home in 5 Days" 3 times. The results were amazing! We had over 200 people through the door and 27 offers. I did not finish the round robin process until Monday night. I felt empowered throughout the whole process. The best part is I have a wonderful safety net — a "backup" buyer willing to pay only $500 less than our highest offer. I would do this again in a heartbeat! FAST and Make More Money in ANY Market! This amazing book, “How to Sell Your Home in 5 Days,” is literally all you need to learn how to sell your home fast, not to mention cheaper, on your own than using a real estate agent, or running a traditional for-sale-by-owner! This book has been used to help thousands of homeowners from coast to coast sell a house fast and successfully in just 5 days. You don't need any previous real estate experience! You don’t need weeks or months of training seminars — costing hundreds of dollars — to teach you how to sell your home fast and get fair market value. All you need is this comprehensive, easy to understand selling guide! Don't Use Conventional Selling Methods Designed to Waste Your Time and Money! Read This Book to Sell Your Home Fast and Get Fair Market Value in 5 Days! What Will This Book Teach Me? "How to Sell Your Home in 5 Days" leaves no detail un-addressed. It is an all inclusive guide to how to sell your house fast yourself. There are no other materials needed to learn how to sell your house fast and successfully other than this book. You'll learn the following and much more! This book covers it ALL! You won’t need to spend days of your life reading this book, or preparing to sell your home. “How to Sell Your Home in 5 Days” is meant to be read in a matter of hours. You can read and re-read this book, absorb the method, and prepare to be able to sell your home on your own in a very short period of time. This book makes YOU a real estate expert in record time! “How to Sell Your Home in 5 Days” is easy to follow, and its instructions on how to sell your home fast are incredibly simple, written to spell out the whole process without overwhelming you. Finally, a selling guide that takes the guess work out of how to sell your home fast. Act Fast to Get Your Free Consultation with the Purchase of this Book. For a limited time only! If you purchase the book on how to sell your home fast today for just 10 dollars, you’ll get a half hour of FREE personal coaching! I’ll give you a FREE half hour-long 5 Day Sale consultation, to answer any of your questions about the book, using it to sell your house fast, and your specific selling situation. I’ve helped countless homeowners use this method to sell a house fast since I ran my first 5 Day Sale twenty years ago, and I have earned the reputation of being the nation’s foremost expert in the 5 Day Method. Hurry, this offer won’t last! Only serious homeowners, please! If you’re not interested in saving yourself thousands of dollars; or if you don’t really want to sell your home fast and with less headaches and would rather wait for months playing it safe and losing money with an agent; then this book, and the free consultation, will not benefit you. However! If you would like a stampede of buyers clamoring to pay you top dollar for your home, you want to sell your home fast, and you want to have complete control of when your home is sold . . . then this book and free consultation are, without question, your complete sell your house fast solution. Don’t be a selling victim waiting for a buyer! Bring hordes of qualified buyers right to your doorstep! Get your book today to free yourself from the waiting game…Sell in 5 days! What Real Estate Agents DON’T Want You to Know! Selling your home fast is easy! Anyone can successfully sell a house fast. You simply need to know how to attract qualified buyers to your property and inspire them to compete for your home. It is remarkably easy to sell your home fast when you learn how implement the right marketing strategy. 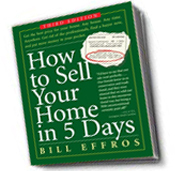 This book, “How to Sell Your Home in 5 Days”, teaches you how to sell your home fast! You’ll get a great selling price exactly 5 days after you start your marketing campaign. You save potentially thousands of dollars because you don’t need a real estate agent to run this sale, and you won’t have to pay costly monthly upkeep expenses while you wait for the right buyer to come along. Interested? Get the book and see for yourself just how easy it is to sell your house fast! "I'd have to say that our sale went perfectly — even with our Open House the first weekend in December!" We knew nothing about the 5 Day method until we came across the book at our local library. In fact, to our knowledge, no one in our area had ever used the 5 Day method or was familiar with the idea. We were fascinated by the concept of selling our home so quickly; and since we were building a new home and wanted to sell our current home to avoid the extra move, the 5 Day method was really perfect for our situation. I'd have to say that our sale went perfectly — even with our Open House the first weekend in December! Our friends know us as conservative and traditional, and they were amazed that we sold our home in this unconventional way, but being a little unconventional certainly paid off! This was a great experience for us, and our teenagers were thrilled that their rooms only had to be spotless for 2 days! You can choose the exact day your home will be sold! In a perfect world, you’d put your home on the market, and that same day you’d have the perfect qualified buyer willing to give you an amazing price for your home. The reality is, you could wait for months or not be able to sell at all! You could very realistically end up buckling under the stress and strain of paying for two properties at once. Well, it’s not a perfect world, but you CAN sell your home at fair market value — in just one week. Finally, you can schedule the sale of your old home so it lines up with the purchase, or first payment, of your new home. A 5 Day Sale gives you the ability to select the exact weekend that your home will be sold. No waiting, no guessing, no worrying. You don’t have to keep your home “show worthy” for months! Let’s face facts here; none of us live in a model home. The kids toys aren’t always neatly put away in perfect little cubby holes and their beds meticulously made. You don’t always have time to do the dishes or vacuum the floor. Months of constant cleaning for your agent’s “spontaneous showings” disrupt your daily life! And for what? Half the time your agent is showing your home to people who are looking for something else. It’s bad business, and it’s a waste of your time and money. 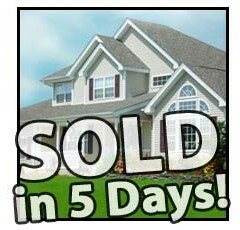 “How to Sell You Home in 5 Days” shows you the method that allows you to sell your house fast, and make a real profit! Your home needs to be clean for only two days during your open house weekend. After that, be as sloppy, or as neat, as your life dictates because you were able to sell your house fast! AND the shorter selling schedule when you sell your house fast actually gets you *more* money for your home than having it sit on the market for months! "Buyers will compete with other buyers in a dynamic that will drive the offers on your home straight to the top-end of fair market value." This book shows you how to price your home correctly. It shows you how to alert ALL qualified buyers in your area, and how to create a buying frenzy for your home. Buyers will compete with other buyers in a dynamic that will drive the offers on your home straight to the top-end of fair market value. Your Realtor is playing pricing games with your home! BUT, buyers are in fact informed! (Wouldn’t you be?) Once your home sits on the market with an inflated price for “X” number of months, your agent has to suggest dropping the price. They keep on pushing you to continue dropping the listing price until it’s actually below market value, because interest in your home has gone stale. You may then be inclined to take offers you’d never considered in the beginning — losing money because you’ve taken less — and on top of that you’re paying a hefty sales commission. Other agents may try to talk you into listing your home for a lower value knowing that it will sell your home so they don’t have to work as long and as hard (this is actually the larger risk for the seller as it may leave thousands or even tens of thousands of dollars ‘on the table’ as your home gets scooped up far too fast). 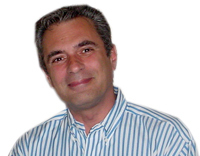 Learn how to sell your home risk-free with a FREE 30 minute consultation with national 5 Day expert, George Cappony. If you don’t want your agent to play games with your schedule or the price of your home, then you MUST read this book! Rather than souring your sale with an inflated price buyers would be silly to pay, and letting the market drag your price into the mud; follow the simple guidelines of this book, and let the buyers in the market compete such that you get the top end of fair market value — in just one weekend. "The 5 Day Sale has worked for me three times!" I am a real estate investor and focus on buying and selling pre-foreclosure houses. Once I buy a house, it is imperative for me to sell it as quickly as possible. The 5 Day Sale has worked wonderfully for me three times! After buying the book, I listened in on a free 5 Day in America Conference Call-in Event. George invited me to call him the next day to help me with some details, which I did. With his expertise and knowledge, he was very helpful in guiding me through the process. So, I ordered some signs, scheduled the open house, and placed my ads. I got my minimum of 25 calls by Thursday night and had a high bidder on Sunday night. I've repeated the same process twice with the same results. I was a Realtor for two years, so I know how long it can take to sell a home and how expensive it can be. To sell quickly and save a commission, I highly recommend the 5 Day Sale. This is the fastest way to sell your property successfully. Within just a few weeks of deciding to sell you can realistically have 50 to 100 sets of people coming to your open house, and dozens of parties, or more, competing to buy your home. Without complications, you should close in 30 - 45 days. It is very inexpensive. You can effectively sidestep a 5 to 7 percent real estate commission, long term advertising costs, costly improvements to the property, closing costs, and more when you sell your house fast. It is the simplest way to sell your property. Inspections and "showings" are limited to one weekend. The sale is usually conducted on Sunday night and a preliminary purchase agreement can be signed the very next day. It will very clearly establish the "market value" of your property, regardless of what appraisers and brokers may hypothesize. You have all the power, not your broker, or your buyer. A 5 Day Sale gives you the ability to run the sale you want, on the timeframe you’re comfortable with. You select the date of your sale. "I will walk away from the sale being able to pay off two mortgages, AND I will net enough to put a substantial amount of money in my pocket." The outcome was perfect. Before running across the book at Barnes & Noble, I had interviewed a few real estate agents. They all told me that I would be able to sell my house for just enough to pay my mortgages and their commission, but I wouldn't net anything to myself. Thanks to this method, I will walk away from the sale being able to pay off two mortgages, AND I will net enough to put a substantial amount of money in my pocket. This is an incredible system. Guaranteed to Teach You How to Sell Your Home Fast – in 5 Days! Here’s the bottom line: the book “How to Sell Your Home in 5 Days” has been around for over 10 years. It has been featured by major media outlets like articles in the N.Y. Times, and with video news networks such as CNBC, and CNN. It has a following of professional investors behind it, happy and satisfied first time and repeat home sellers. It’s been recommended by professional real estate mentors, and it’s successfully worked for thousands of people across the country to sell a house fast. You judge for yourself if it’s worth reading. It’s worth your time and money just for the possibility that this method could free you from the burden of wondering if, and when, your home will sell. Copyright © .Sales Systems Inc. All Rights Reserved.